It is 5:45 a.m. It is dark outside, and the only things awake are the birds and the few people that go to work that early in the morning. 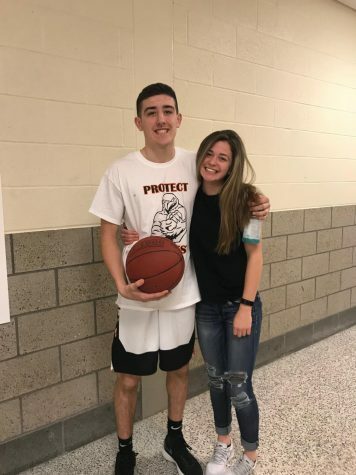 However, if you were to walk into the BPHS Main Gym at that time, you would find Lauren Mullen practicing her pull up jump shot before school. Lauren Mullen is a junior and this is her second year as a member of the Hawk Eye team, and she was brought here thanks to Alex Mullen, who recommended the class to her. Mullen brings social media presence and sporting event photography to Hawk Eye. She is one-half of the weekly feature Fun Faculty Fact Friday, working alongside Juliana Carbone. She also takes pictures of sporting events, such as boys basketball, softball, boys volleyball, and lacrosse. Lauren is a two-sport athlete, playing on the girls basketball and golf team. While athletics are important to Lauren, her academics are highest on her list of priorities. Mullen is a member of National Honors Society, Principal Advisory Council of Students, Camera Club, and Quill and Scroll National Honors Society. After high school, Lauren would like to play basketball in college. If she could have any superpower, she would like to be able to control her height. Her dream vacation is to go to Mt. Pinatubo in the Philippines, and swim in the active volcano. In Lauren's eyes, the perfect date would be a spontaneous trip to the beach. Be sure to tune in for the Fun Faculty Friday's every week, and to check out the photo gallery to see everything that Lauren does!